The mammoth home run Robin Roberts hit on Oct. 14, 1951, remains a highlight in the 80-year history of the Riverton Athletic Club. Roberts, a Springfield native who had just completed the second of his six 20-win seasons as a major league pitcher, was playing in the club’s annual game against Auburn. The Auburn team was led by another major-league star, Auburn native son Emil “Dutch” Leonard. 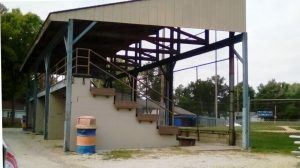 In fact, both teams were larded with professionals, along with some of Sangamon County’s top semi-pro and amateur baseball players. Similar star-studded contests became a tradition at the Riverton Athletic Club over the next three decades. Roberts pitched only two innings in the 1951 game, playing second base the other seven innings. But he also hit two homers to lead Riverton’s 5-2* victory. The Riverton Athletic Club was just one among many athletic associations sponsored in Riverton and elsewhere in Sangamon County in the late 19th and early 20th centuries. However, it was one of the most active such groups, especially when it came to baseball. The first Riverton Athletic Club was formed in the 1890s. Its focus apparently was to sponsor boxing matches. It’s not clear how long that club stayed in operation, but an Illinois State Register advertisement in 1920 promoted a Riverton Athletic Club boxing night. The main event pitted coal miner Buck Montgomery Dawson against an opponent the ad described as “Kid Snowball (colored welterweight of Houston)”. 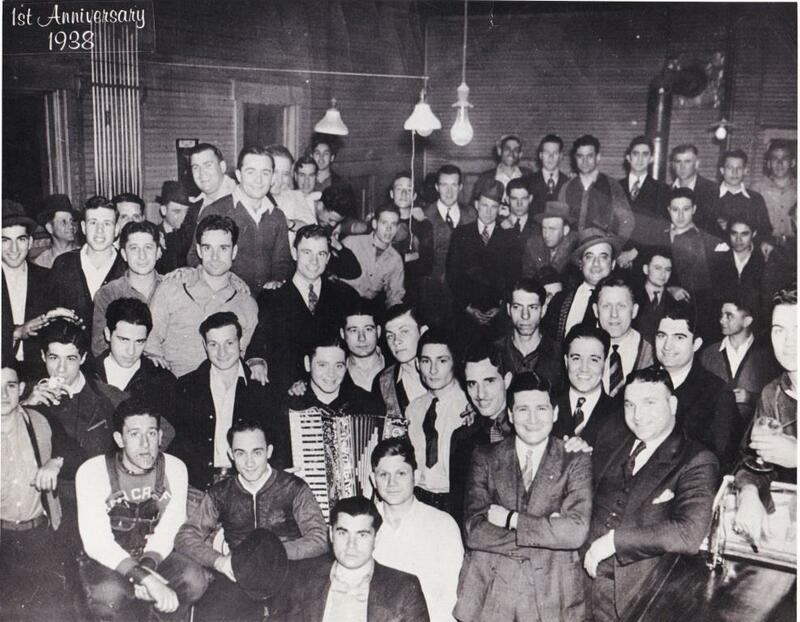 The modern Riverton Athletic Club was founded in 1937 and received its official state charter two years later. The incorporators were listed as H. Ippolito, E. Ciota and R. Watson. Robert M. “Bob” Watson (1916-70) would remain one of the club’s top officials for 30 years. 1897 Riverton baseball team (Sangamon Valley Collection)club’s top official for 30 years. The RAC sponsored teams in softball, bowling and basketball, but easily the most popular, in both participation and viewing, was baseball. 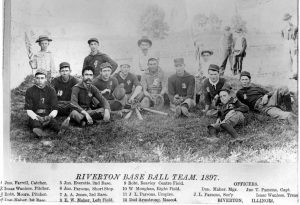 Baseball was historically big in Riverton, as demonstrated by an 1897 photograph that shows a Riverton baseball team, complete with uniforms and mascots. Teams from within the village and surrounding communities would practice their sport at every opportunity. Riverton Athletic Club baseball games originally were played at Liberty Field on Riverton’s east side. The club disbanded during World War II, but when members returned from service, the club was resurrected with renewed vigor. The RAC incorporated in 1946 to lease and later buy property off what was then U.S. 36 (now East Lincoln Street) to build a new ball diamond and clubhouse. 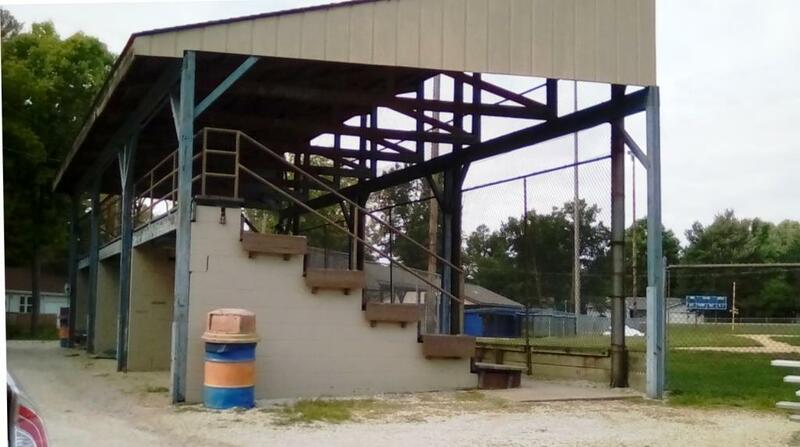 The diamond was one of central Illinois’ most elaborate, with true dugouts and covered bleachers. It became home to all ages of athletes, from the youngest Little Leaguer to near-pro teams. The Riverton-Auburn challenges began in 1949 and continued at least into the late 1950s. The 1951 game attracted an estimated 1,200 fans to the ballpark. But the RAC’s biggest draw may have been its annual Fourth of July tournament, which drew amateur teams from around the Midwest. Added to the tournament later was the club’s popular Old Timers Game, which starred many retired athletes from the area, pros as well as amateurs. The RAC property was a social center of Riverton for many years. In addition to the Fourth of July activities, weekly events included fish fries and burgoos. Free movies were shown on a portable screen set up in center field. Circuses and carnivals were a frequent summertime draw. With more school-sponsored sports and the rise of other entertainment attractions, however, the RAC eventually was forced to sell its ball diamond to the Riverton School District. The club itself endures, however, and, as of 2018, members could still watch Riverton High Hawks’ baseball games from the clubhouse deck. *The Illinois State Journal’s coverage of the 1951 game, both story and headline, says the score was 4-2. But reading the article closely reveals that Riverton scored four runs in the third inning, three of them on Roberts’ first home run, followed by a fifth on Roberts’ long homer in the seventh. This entry was posted in Amusements, Parks, Social life, Sports and recreation. Bookmark the permalink.